Araflora specialises in unusual and exotic indoor and outdoor plants.The Araflora webshop has opened in 2013 year and we welcome you to buy a nice exotic plant. For the moment not all the exotics plants are for sale we are working to put new products in every week. Araflora offers an unique assortment of colours, shapes and sometimes even fragrances. Because of our own cultivation in the Netherlands and international purchasing contacts we can offer you a large assortment of high quality plants. Araflora supplies private customers and business enterprises. Both inexperienced plant lovers as the experienced botanist can visit Araflora for flora and accessories. Araflora brings the wonders of nature to your door. •Hardy exotic plants for the garden; such as tree ferns, yucca’s, cacti, hardy palms, bamboos and grasses; •Exotic and remarkable plants for windowsill, conservatory or containers; •Orchids and other flowering plants; •Cacti en succulents; •Carnivorous plants, for beginners and collectors; •Terrarium and vivarium plants, to create a tropical jungle; •Aquarium-, pond- and bog plants; •Bulbs, rhizomes and seeds of exceptional plants. 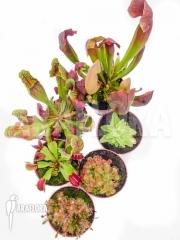 Apart from flora, you can also order different accessories from us, such as grow pots, terrarium light and growing medium, for optimum growth and maintenance for your plants. Ara is the famous Amazon parrot. This bird searches the whole world, for remarkable, beautiful and exotic flora.